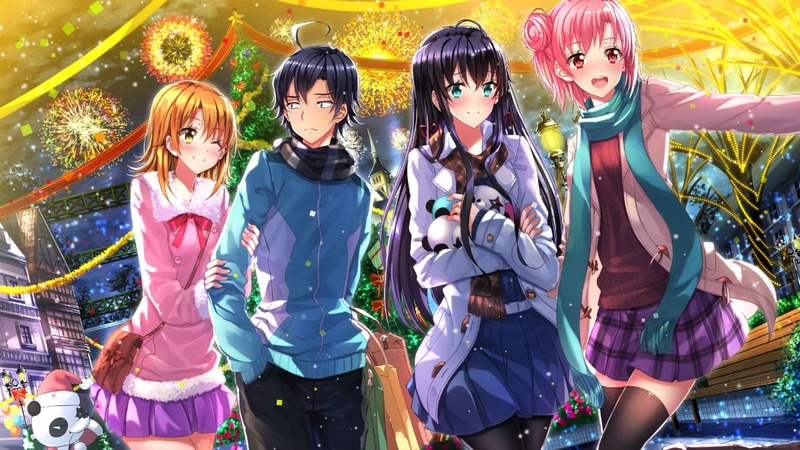 Updated April 3, 2019: Added news of the indefinite delay of My Youth Romantic Comedy Is Wrong, As I Expected Volume 14 and how that book affects My Teen Romantic Comedy SNAFU Season 3 aka OreGairu Season 3. Updated March 23, 2019: Added the preview video trailer for OreGairu Season 3. OreGairu Season 3 has officially been confirmed to be in production by the April 2019 issue of Monthly Sunday GX manga magazine. After Season 2 left audiences hanging with a huge cliffhanger, Hachiman Hikigaya, Yui Yuigahama, and Yukino Yukinoshita will finally be returning for more Volunteer Service Club adventures in My Teen Romantic Comedy SNAFU Season 3 (Yahari Ore no Seishun Love Comedy wa Machigatteiru Season 3). But will the third season of the anime series be the final ending of the story? The initial announcement of the new OreGairu anime did not specify the animation studio, staff, or the cast. More details are expected to be released during AnimeJapan 2019, which begins on March 23, 2019. The first season was produced by Brain’s Base but then switched studios to Feel Studio for the second season. The character designs noticeably changed after the studio switch. While it’s currently unknown if Feel Studio will return for producing OreGairu Season 3, the teaser art that was released does resemble the character designs from the second season. This article provides everything that is known about My Teen Romantic Comedy SNAFU Season 3 and all related news. As such, this article will be updated over time with news, rumors, and analysis. Meanwhile, let’s delve down into what is known for certain. Yahari Ore no Seishun Love Comedy wa Machigatteiru light novel series ending in 2019… Maybe? The My Teen Romantic Comedy SNAFU anime series is based on the Yahari Ore no Seishun Love Comedy wa Machigatteiru light novel series (My Youth Romantic Comedy Is Wrong, As I Expected) by author Wataru Watari and illustrator Ponkan8. Started in 2011, the OreGairu book series was up to Volume 13 as of November 20, 2018. 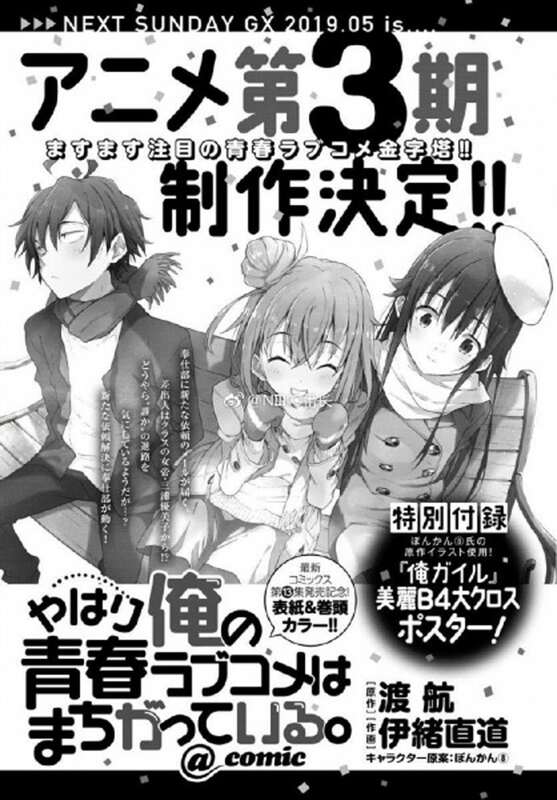 OreGairu Volume 14 was originally scheduled to release in November 2019, but it was delayed until March 2019, then again to April 18, 2019, and now the final book’s status is uncertain. In early April 2019, the official website for GAGAGA Bunko announced that the release date for Volume 14 has been delayed indefinitely. The publisher would only say that the delay is due to “production reasons”. Although the ending of OreGairu Season 3 will be based on Volume 14, the announcement did not specify whether the book’s delay will have any effect on the anime adaptation. The books spawned three separate My Teen Romantic Comedy SNAFU manga adaptations from manga artists Rechi Kazuki, Naomichi Io, and Yuta Taneda. The first two manga series are up to 10 and 12 volumes, respectively, while the third manga series was a four-panel manga that finished back in 2015. The official English translation for both the OreGairu manga and the light novel series is licensed by Yen Press. Unfortunately, the English light novels were only up to Volume 7 by February 2019, while Volume 8 is scheduled for October 29, 2019. 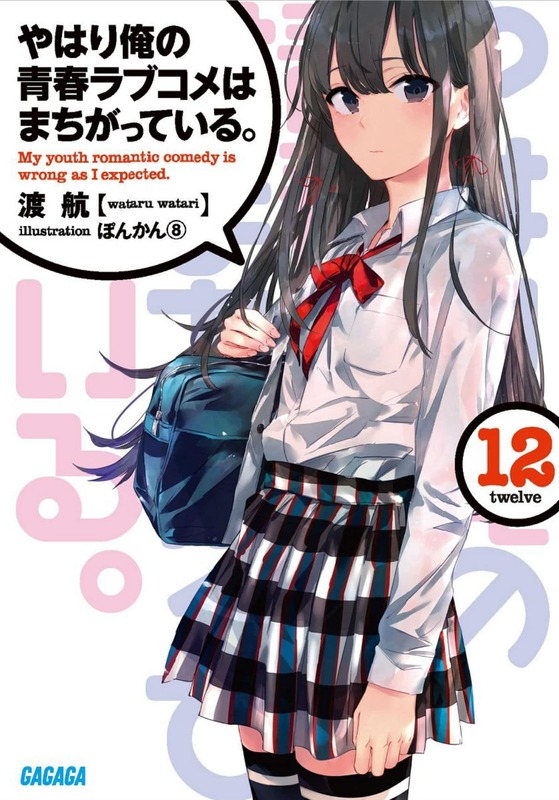 Volume 10 of the main manga series, My Youth Romantic Comedy Is Wrong, As I Expected @ comic, released on March 19, 2019. Season 1 covered the story events of Volumes 1 through 6 of the OreGairu light novel series, while anime Episode 13 covered Volume 6.5. Season 2 was a direct sequel and covered Volumes 7 through 11. OreGairu OVA 2, which released in 2017, covered Volume 10.5 and from a timeline perspective, it fits in-between episodes 10 and 11 of Season 2. Back in the fall of 2018, it was announced in Dragon Magazine that My Youth Romantic Comedy Is Wrong, As I Expected Volume 14 will be the ending of the entire story. Therefore, it is very likely that OreGairu Season 3 will adapt the entirety of the final story arc, which began with Volume 12. For fans of the light novel series, this is probably good news indeed. Anime adaptations will often change the order of events or skip certain story events for lack of time, but since OreGairu Season 3 is adapting about half the usual books in a single season it’s possible the final anime season will follow the books more closely. As of the last update, any company related to the production of the anime has not officially confirmed the Oregairu Season 3 release date. The production of a sequel has been announced, but the general time frame for the My Teen Romantic Comedy SNAFU Season 3 release date is currently unknown. The last time audiences watched the anime, the second season ended right after the Valentine’s Day event with Yukino having a request for Hachiman at the aquarium. But audiences were left hanging since she never told him what that request was in detail. After the date, Hachiman and Yui go home with Yukino to meet up with her older sister, Haruno Yukinoshita. Yukino has decided to finally confront her mother with the support of her sister, but she’s still trying to gather her resolve. In the last season, Hachiman’s little sister Komachi had taken the Sobu High School entrance exams. In OreGairu Season 3 we find out that she and Taishi Kawasaki are both accepted to Sobu. Student Council President Iroha Isshiki decides to hold prom and she ends up asking the Service Club to help set up the event. However, the parents’ school board is against holding a prom and Yukino’s mother is out to stop the prom. Can Yukino stand up against her mother? The prom is merely a backdrop to the big questions the youth face in their lives. They may be content to stay where they are for the moment, but in order to move forward, they must put their feelings into action and find an ending to the present. One part of their lives that must end is their current relationship status. But then Yukino puts an end to even the Volunteer Service Club itself! How this story ends not even readers of the My Teen Romantic Comedy SNAFU books know yet. Unfortunately, anime-only fans will need to wait until the Oregairu Season 3 release date to watch the ending. Stay tuned!